This is an ideal textbook and reference source for researchers interested in sampling methods, survey methodologists in government organizations, academicians, and graduate students in statistics, mathematics and biostatistics. This textbook can be evaluated as an introduction to the methodology and applications of the advanced topics of the sampling theory. Requiring only basic sampling information, this text is one of the few to offer a graduate-level introduction to have adequate knowledge of proposing complex estimators in sampling theory. 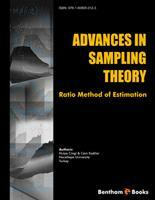 Because of this aim, “Advances in Sampling Theory-Ratio Method of Estimation” makes difficult concepts easy to grasp for the readers and many theoretical discussions about the latest estimators in literature are incorporated into almost all of the chapters. This feature helps the academicians acquire necessary skills to follow up recent studies on their own. Therefore, this book is sufficiently detailed to enable the reader to learn advanced topics and develop new methods without outside assistance. More than just an introductory text, the reader, who has mastered the contents of this book, will be in the level of making a major contribution to the technical and research literature for sampling theory. We hope that the academicians can propose lots of new efficient estimators on this topic in the forthcoming studies by this book.